Their sophomore release Time Is Up was one of my favourite thrash albums of 2011. 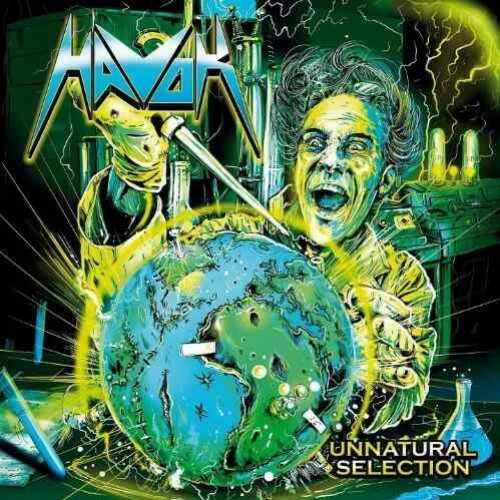 Havok immediately found it’s way to the top of the younger thrash metal bands and it goes without saying that Unnatural Selection was an album that was much anticipated in thrash circles. The first few spins of Unnatural Selection left me with a feeling that this was not what I had hoped for. Where Time Is Up found it’s way to my brain easily this wasn’t the case with Unnatural Selection, somehow the click just wasn’t there. The songs sounded more than okay, but it just didn’t had the same immediate impact than it’s predecessor had. Gradually my opinion has shifted. While I still don’t think that it’s up to par to Time Is Up, I have grown to like the album and quite a bit to be honest. The Death Angel biters like ‘Give Me Liberty..Or Give Me Death’ and ‘I Am The State’ kick your brain in instantly and show the full speed or die side of Havok. Great way to start your album! After that I must admit around midpoint the songs don’t grab me as much. While ‘Waste Of Life’ and ‘Under The Gun’ are okay, they aren’t of the level that I know Havok is capable of performing. Luckily with ‘Chasing The Edge’ and the Black Sabbath cover ‘Children Of The Grave’ , they redeem themselves. Disappointment is not really the term to describe the album, since it wouldn’t do honour to some excellent thrash songs that inhabit Unnatural Selection. Though I expected a little bit more interesting songcraftingship from the lads, especially with the experience that they have under their belt now. There are quite some riffs that are borderline chewed out and I hope they find some other points of view on thrash metal for their next album so they won’t become another stale thrash band!